If it didn’t take a zillion tests to make new vehicles road-worthy, a lot of crash dummies would be out of work – and a lot of automotive researchers, too. But sophisticated simulators and high-tech research facilities can’t always get the job done. Sometimes, there’s a need for speed. In upstate South Carolina, the International Transportation Innovation Center (ITIC) aims to meet that need with a mile-long test track that allows for safe, efficient testing of functions ranging from braking ability and wind noise evaluations, to “coast-down” testing of electric vehicles’ energy consumption. Add in features geared to shifting industry trends and priorities – wireless charging, for example – and ITIC appears well-positioned to serve the region’s growing automotive network. “As an academic researcher I find the wide, one-mile track quite unique as it allows testing at highway speeds in a safe controlled environment,” says Ardalan Vahidi, a mechanical engineering professor at nearby Clemson University. He’s currently working on a U.S. Department of Energy-funded project designed to improve energy efficiency in automated vehicles. 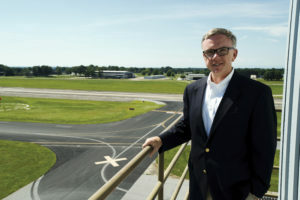 ITIC Executive Director Jody Bryson also is president and CEO of the South Carolina Technology and Aviation Center, the 2,600-acre industrial and research park in which ITIC is located just southwest of Greenville. He points to the park’s economic impact of some $2 billion in the region, with ITIC’s role in the automotive ecosystem an important component. “We’re unique within the state, and we have a statewide impact,” Bryson says. Bryson’s background in economic development includes having a front-row seat as South Carolina developed into an auto industry hub. He’s a former executive adviser to the late South Carolina Gov. Carroll Campbell, whose energetic approach was credited as key to attracting BMW to the state. The BMW plant near Spartanburg started production in 1994 and has had a ripple effect on the economy. Upon taking charge of the park in 2007, Bryson decided a branding decision was needed. 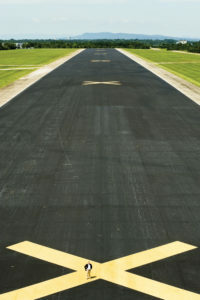 The sprawling park, which includes a small airport, is co-owned by Greenville County and the city of Greenville. It was an Army Air base during World War II and still has Lockheed Martin as its major occupant. The park was long known as Donaldson Center. No offense to Capt. John Donaldson, the World War I flying ace for whom it was named, but the place needed a name more likely to show up in an internet search. So, the park became the South Carolina Technology and Aviation Center, SCTAC for short. Despite recession pressures on the auto industry, Bryson envisioned ITIC in 2010 as a global economic resource – a player in both auto manufacturing and academic research. He and Joachim Taiber, chief technology officer, have worked to make that vision come true. Its nonprofit status allows ITIC to receive private and public grant funding. Bryson also stresses that ITIC isn’t tied to any one manufacturer or academic institution, to encourage a variety of collaborative partnerships. But collaborations were inevitable with Clemson’s International Center for Automotive Research (CU-ICAR), founded in 2007, just a few miles away. Taiber, who first worked for BMW in his native Germany, was involved in planning ICAR and has connections there. A recent vehicle in Clemson’s innovative series of concept cars, Deep Orange 8, was tested on the ITIC track. Taiber, who joined ITIC in 2016, says simulators and other tech tools can’t take the place of road tests. “Auto manufacturers will need testing, and ideally it should be done close to their plants,” Taiber says. He adds that a test bed like ITIC’s also can serve suppliers of automotive components, such as sensors. Electric and autonomous vehicles are top-of-mind in South Carolina as they are elsewhere. When Volvo Car USA broke ground on its first American factory near Charleston in 2015, the company announced it would produce only electric and hybrid vehicles. So it’s no coincidence that Bryson journeyed to Sweden for an auto summit in February 2018. “We’ve made [Volvo] aware of our test bed and our capabilities … and we’re prepared if they call,” he says. Taiber says important areas for testing electric vehicles include determining the optimal infrastructure for charging, tracking energy use during various maneuvers, and paring down charging time from the now-typical 30 minutes to the preferable 15 minutes. As autonomous vehicles come into wider use, Taiber believes ITIC is well-suited to handle testing for those. Vahidi agrees. “Development of autonomous vehicles requires much testing for debugging, improvement and certification, and not all of these can be done on open roads,” Vahidi says. “Accidents that happened recently with autonomous cars underline the importance of test track testing before road deployment. “Given that most of the autonomous testing has happened on the west coast and some in the Midwest, ITIC can play the role of an east coast hub for testing autonomous vehicles, electric and hybrid vehicles included,” he says. Vahidi was involved in an intriguing project involving autonomous vehicle research, reported by Clemson in March 2017. Its goal would win applause from many a motorist: To reduce the 7 billion hours a year that Americans spend stuck at traffic lights. Vahidi and another researcher used the ITIC track to set up a simulated intersection, marked by orange traffic cones. Driving their own vehicles, they used smartphone apps to test a system regulating traffic with a cellular network centered in the intersection itself – not in traffic lights, which so often leave us waiting for red circles to turn green. It’s not the flying cars of The Jetsons, but it does envision a future urban environment in which all the vehicles are autonomous. 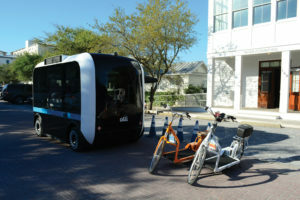 Along that line, ITIC also is working with the 30A Mobility Project of the Seaside Institute in Florida. The goal is to seek solutions for environmental and traffic congestion problems facing Seaside, a planned community in the Florida panhandle. As Bryson and his ITIC team work to handle logistics for any conceivable task related to automotive testing, they’ve also made the facility available for other purposes. Both the Greenville Police Department and Greenville County Sheriff’s Department have used the main ITIC track for training on high-speed maneuvers and chase scenarios. Greenville Police Corp. Mark Huntington calls it an ideal location for simulating situations officers may encounter on the job. Bryson and Taiber praised the pro-business atmosphere in the Greenville area, located along the Interstate 85 corridor between Charlotte, North Carolina, and Atlanta. Having weathered the last recession, Bryson and Taiber know today’s promising trend can become tomorrow’s thorny crisis. But they believe they can continue to fine-tune ITIC’s testing capabilities to not only boost the regional economy, but help create the vehicles of the future.